He called climate change an "all-encompassing priority." Green Party Leader Elizabeth May asks a question to Prime Minister Justin Trudeau in the House of Commons on Oct. 3, 2016. 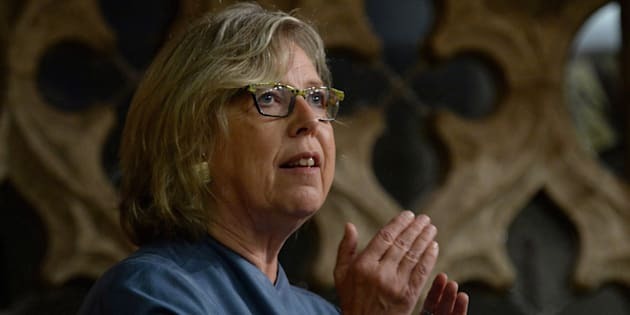 Green Party Leader Elizabeth May has invoked a late Liberal MP's last words to the House of Commons to pressure the prime minister to do more to confront the threat of climate change. May rose in question period Wednesday on the heels of a report from the federal environment watchdog that warned Canada is woefully unprepared for the storms, floods, and fires expected to result from climate change. She quoted the final remarks of Arnold Chan, the Toronto MP who died of cancer last month. Chan's speech was read into the record by his Liberal colleague Mark Holland just days before his funeral. "It is imperative that we stop treating climate change as solely an environmental issue, but recognize it as an all-encompassing priority that we as a society and a government must confront with the utmost urgency," she said, using Chan's words. Yet May said the report from Environment Commissioner Julie Gelfand, released Tuesday, makes plain what most already know. "We're not there. We're not acting with urgency. We're not acting," May said. She urged Trudeau to "commit to a re-set" that would seriously reduce emissions. Trudeau instead touted how, a year ago this week, he took the step of announcing a pan-Canadian price on carbon pollution. "This is the kind of leadership that we never saw from a previous government. We know there is a lot more to do but we continue to work diligently on protecting the environment and growing the economy together in ways that will benefit future generations." The Trudeau government is phasing in a carbon price of $10 per tonne in 2018 that will rise by $10 per tonne until it hits $50 per tonne in 2022. Conservative Leader Andrew Scheer has claimed the tax will "raise the cost of everything" and make Canadian businesses less competitive. Chan's last speech lauded both May and Environment Minister Catherine McKenna for their leadership on what he called one of the great "existential threats" facing his children's generation. Justin Trudeau and MP Dominic LeBlanc are shown lifting Arnold Chan while escorting him in the House of Commons on Sept. 15, 2014. "Climate change is not just about storms, flooding and heat. It is also about crop failure, food shortage, water scarcity, mass displacement of people, and the violent conflicts that can arise out of those situations," Chan said in his remarks. May and New Democrats have been sharply critical of Liberals for adopting the previous Conservative government's carbon emissions targets. Earlier in question period, NDP MP Guy Caron — who was just chosen by new leader Jagmeet Singh to pinch hit for him in the House — called Gelfand's report "devastating." Caron noted how the watchdog found only five of the 19 federal departments that were audited have identified risks related to climate change. Caron also criticized the government for greenlighting pipeline projects while Canada is on track to fall short of its Paris climate deal pledge to cut emissions to 523 million tonnes by 2030. "Do the Liberals understand that when it comes to the environment, the proof is in the pudding?" he asked. Trudeau responded that the federal government has a "concrete plan" to cut emissions for the first time in Canada's history. "The Conservatives ignored our environmental responsibilities for 10 years. The NDP is not focused on growing the economy," Trudeau said. "We know we have to do them both together."